Over the last two weeks, my blog has covered the basics of preparing your lawn in spring and how and when and how to fertilize it. This week, I’ll talk about weed control. The next blog will cover pest and disease control. There is no universal definition of a weed. You may be content to see clover among the grass stalks in your lawn, while someone else reaches for the Roundup. Some people carefully scrutinize their lawns and remove any undesirables with tweezers while others are content as long as the weeds are green. Is it enough to eliminate the crabgrass and broadleaf weeds and leave some clover mixed in your lawn? Or do you want a lawn as luxuriant as a golf course green? Frankly, having a completely weed-free lawn is setting the bar rather high, and will require frequent application of weed control products. Since most herbicides are synthetic, a totally weed-free lawn is not compatible with an organic-only care philosophy. There are two major categories of weed control: pre-emergent and post-emergent. The pre-emergent treatments prevent seeds from germinating. This helps control weeds like crabgrass, which begin from seed each year. There are several kinds of synthetic pre-emergent products available. Pre-emergent herbicides won’t do much to get rid of plants like dandelions that overwinter in your lawn and spread through roots. Post-emergent herbicides target broadleaf weeds, such as dandelions, plantain and ground-ivy. Some can be applied to the entire lawn; others are made to squirt directly onto the offending weed. The herbicide will be absorbed into the weed and kill it off, roots and all. Be careful – it will kill anything it touches with leaves, including your annuals and perennials. There are no comparable herbicides in organic care. Ideally, as you create a healthier environment for grass, it will become harder for weeds to compete. 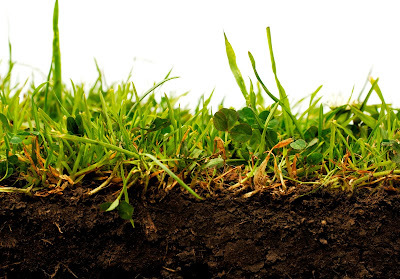 Weeds tend to thrive and out-compete grass in compacted soil—which is why annual core aeration is a good technique. There are organic vinegar-based spot-herbicides that can be sprayed on weeds—but they can kill grass as well, if you’re not careful. Perhaps the best organic practice is to pull weeds by hand. There are several hand tools designed to remove weeds; just make sure you extract the entire root or the weed will grow back. How often you apply weed controls depends upon your philosophy and your budget. Although pre-emergent controls are usually applied in early spring, the post-emergent controls can be applied as you notice the weeds appearing. You can just use them in the areas where weeds are apparent. They are usually applied when the lawn is dry; they need a few hours free of rain or watering. When Almstead provides lawn care to our clients, we typically offer two applications of pre-emergent herbicide in spring, and then follow up with monthly inspections, applying post-emergent controls as necessary. Hand-pulling weeds is usually easiest when the ground is moist. If you intend to compost the weeds, make sure you turn your compost pile often and that it gets warm enough to kill the seeds (over 131 degrees). Otherwise, you’ll wind up cultivating them rather than killing them.